The act of reading is a skill that everyone learns how to do in grade school. We learn our ABCs in Kindergarden and our parents read us books, so that one day we can read on our own. But I want to talk about a different set of skills that book readers have. To keep from running into any of the things I listed above, book readers have to develop a sense of situational awareness. For me, I read while making my way to and from the train. I’m primarily walking through a parking lot (which doesn’t have a lot of cars driving around in it at one time) and I’ve pretty much memorized the path I take, so I know where those static objects will be. The only thing I need to worry about is looking up every once in a while to make sure I don’t plow through someone. I’m essentially still aware of what is around me even though I’m reading. I say that’s a skill. I can say that I have yet to master this skill, but I see a lot of people doing it at the gym. 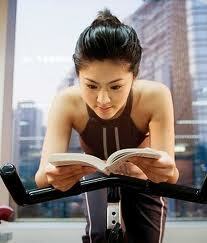 To read a book while you’re working up a sweat and trying to focus on toning those abs, takes real skill. I tried it a few times, but I can’t seem to focus on the reading part. I guess just doing a slow walk on the treadmill would work for me, but I have to do much more than a walk (considering the things I eat sometimes). I really do envy the people that can do this because they probably get more reading done than I do. Thanks to one of my followers I believe that reading while taking care of children is an ongoing skill. I don’t have the honor of developing this skill yet because I have no children of my own, but this is a skill nonetheless. I’m not sure if someone can read while taking care of a child at the same time, but I believe that finding the time to read is a skill. 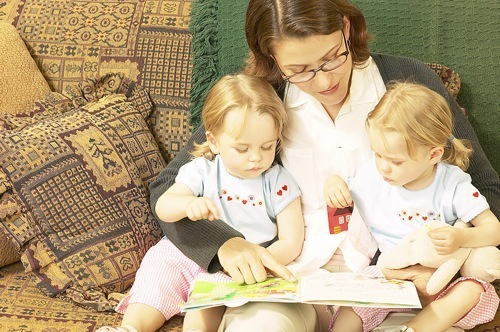 With everything it takes to raise a child, taking even that 30 minutes to read is a skill. This is also an opportunity to teach children to read…which is also a skill. 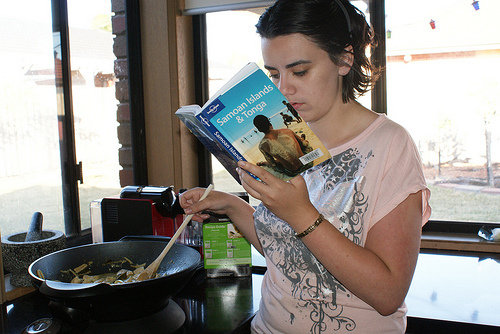 Yes, cooking while reading is a skill. You have to keep from burning your food in the process of reading your book. There’s also the chance of food splattering onto the book or all over you. Essentially, this is the skill of multi-tasking. This is like talking on the phone while cooking, but it has more of a difficulty level to it. I think the main skill we develop while reading in the tub is not dropping our book in the water. I have done this a few times, but practice makes perfect right? It’s also about keeping your hands dry so that you can turn the pages. If a book reader can do those things, reading in the tub is really relaxing. I usually like to bring along a glass of wine and light some candles too. What do you think of these skills? Do you agree or disagree? Are there any other skills you think book readers have?